BCH independent books - AmeriCanada? 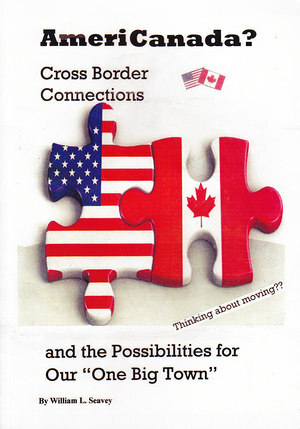 Cross Border Connections and the Possibilities for Our "One Big Town"
When then-President Obama invited Canadian Prime Minister Pierre Trudeau to the White House in early 2016 for a state dinner (the first such invitation in 19 years), there was clearly a need for a thawing in relations that had been exacerbated by the impediments to the Keystone XL pipeline project (as well as various cross border issues in general). Obama declared that the U.S. and Canada were like "one big town." It was hyperbole, but sent a positive message that relations would/could soon be warmer and more cooperative. Then Donald Trump was elected president and he has threatened to "renegotiate" Nafta, the free trade agreement enacted by a conservative president (Reagan) and a Canadian Prime Minister (Mulroney) which has ably served both countries for nearly 25 years. In 2015 Canada exported $412 billion in goods to the U.S. and we exported nearly the same (the trade deficit was only $11 billion at the time). Both countries prospered despite a decline in oil prices. President Trump simply does not understand how free trade lifts all boats and even killed the TPP, which involved both Canada and the U.S. (Canada has gone it alone as a North American partner). Trump is being excoriated by many conservative politicians for his inadequacies but seems hell bent on keeping his promises--however misguided--such as a wall with Mexico, which is clearly a ludicrous idea..
Arguably, free trade is the paramount issue of our time and threatens to sour the U.S.'s relationshsip with Canada once again. In years past various proposals have been made to encourage a stronger union with Canada than has even existed under Nafta. These may not be possible now but there is still hope for the future. My book delineates in detail all the past proposals, and the possibilities for future ones. You can help repair the potentially deteriorating relationship between the two countries by purchasing a copy of this book and sharing it with others. It is not too late. Order five copies for a whopping 60% discount, or three for 40%. I spent six years gathering material for AmeriCanada? and I truly believe it could shape policy well into the future if it is taken seriously and gets into the right hands. I am sending hundreds out to potential policymakers.